Amongst the aristocracy and the wealthy of the 19th century it was for a long time considered vulgar to eat fruit and vegetables. But slowly growing beautiful vegetables in the house gardens became very fashionable and organisations like the Royal Horticultural Society established prize winning competitions for the best gardens and produce. Those living in cities bought their fruit and vegetables from small greengrocers shops. 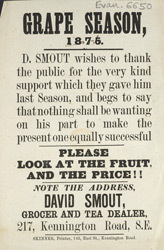 This leaflets draws attention to the grapes that they are selling, they were once a luxury, grown in expensive hothouses but by the end of the 19th century they were more widely available.